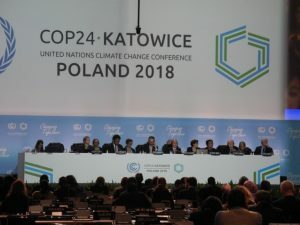 The 24th Session of the Conference of the Parties (COP24) to the UNFCCC, held from December 2 to 14, was a major international conference for discussing rules and regulations related to reducing the emission of greenhouse gases and adaptation to the impacts of climate change after 2020. It was attended by more than 21,500 people from 168 states and the European Union, observer organizations (UN agencies, international organizations, NGOs) etc. The impacts of climate change will become obvious through water issues. It is essential to consider developing measures against and responses to frequent and severe water disasters and droughts in order to maintain sustainable development in the world. In addition, energy saving and energy creation in water management and water use can contribute to the reduction of greenhouse gas. 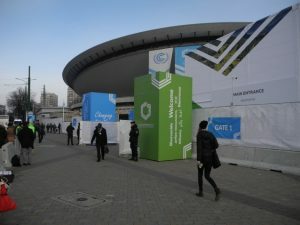 The Japan Water Forum participated in the COP24 with the aim of making Japan’s efforts known to the world. Discussions took place on how to promote private companies’ adaptation to frequently occurring severe droughts and floods under the influence of climate change. 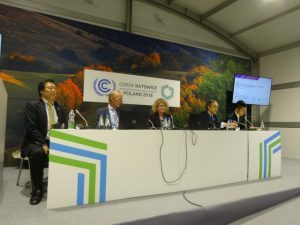 Participants shared and promoted information about concrete examples of climate change adaptation measures by private companies in Sweden, the Netherlands, France and Japan. The session also discussed how to promote climate change adaptation of private companies, particularly preventive measures for water-related disasters and business continuity in the case of disasters. Dr. Tengberg presented two certification schemes available in the food industry, namely SAI FAS (Sustainable Agriculture Initiative Tool) and Global G.A.P (Good Agriculture Practice) and described their benefits and limitations. She also showcased a step-wise approach called Water Journey. It is an online tool that could help private sector actors identify and address water-related risks in food production. Instead of certification, the focus is on a collective “water stewardship” approach, feasibility analysis and involvement of different water users. Mr. van de Guchte described several cases in the Netherlands. One was a primary coastal flood protection structure combined with an underground public garage. The second was a project to provide more space for the river to prevent flooding which was undertaken together with a private development to build business and residential areas. He emphasized the importance of ensuring business continuity in the private sector and pointed out the need for understanding the interdependence of businesses in determining the impact of business interruption in the event of disaster. He presented the case of a Dutch insurance company, which had engaging talks with publicly listed companies on the potential climate risks that the companies were facing. Such information helped these companies promote adaptation actions. He also stressed the importance of the roles of government in increasing engagement of private actors. Mr. Guettier gave three examples of French companies. One was the case of clean energy generation from wastewater treatment and the reduction of CO2 emissions by Suez, in Chile. Another case was flood prevention in Copenhagen, Denmark, by Veolia. The last case was that of small, innovative French company which had helped improve the efficiency of water use in irrigation. In addition, he also described the Business Alliance on Water and Climate (BAFWAC), which was created to facilitate adaptation actions. Mr. Asai presented a Japanese case of private sector engagement, that of the Development Bank of Japan (DBJ), which had established a rating system for companies, based on their business continuity management (BCM). The DBJ provides a discounted interest rate to companies, according to their BCM rating. He noted that other local banks were following this practice. 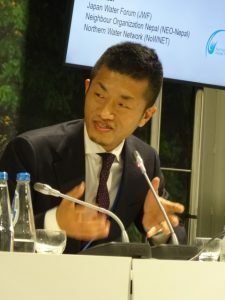 The JWF promoted Japanese efforts in the areas of water management and water use that would contribute to climate change adaptation and mitigation. 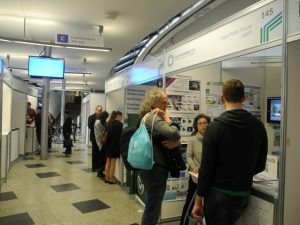 They attracted much attention from participants at the conference. 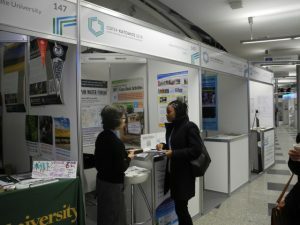 Poster display, video presentations and leaflets that describe businesses, products and services of JWF member companies that are tackling climate change.